Bedford Security supply and install the best quality products. 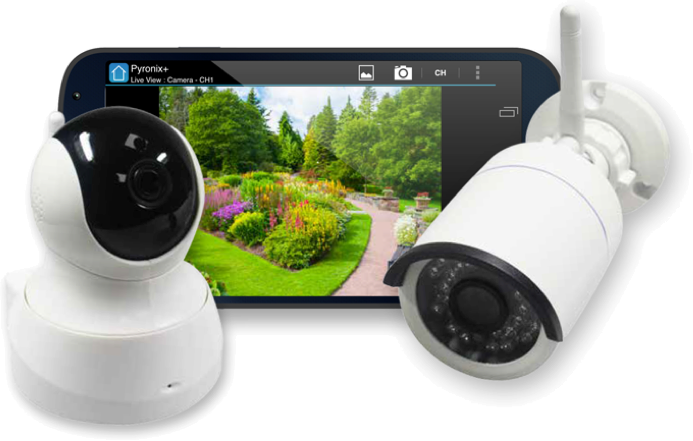 Each home is individual so if you are interested in having a CCTV system installed, we will call to carry out a free survey. Prices will differ depending on how many cameras are required and which system is the best for your home or commercial space. All of our CCTV systems come with a 3 year manufacturers guarantee from the time of purchase. The systems can be viewed via a monitor/TV/PC or even a smart phone so you can view your home while away from the property. The systems will continually record for up to 30 days and then re record over the the first day, so no need to change discs etc as the recording is kept on the hard drive. We also supply and install various low voltage/led security lighting. We can also replace/upgrade existing lighting. Bulk heads, dusk to dawn and flood lights. Please get in touch with one of the team today for a free, no obligation quotation and to receive a free security survey at your premises. Gone are the days of having to manually change CD's to record your footage, we use the best digital security systems to make your life easier. As mentioned above the systems will continually record for up to 30 days and then re record over the the first day, so no need to change discs etc as the recording is kept on the hard drive. If you are interested in seeing how Bedford Security can improve your home or office security, then please get in touch and one of our team will come to your premises and carry out a full security survey free of charge. Our experts will then advise you on the best solutions and equipment to keep your premises secure. We use the highest quality security products on the market, these products are robust and reliable and come with a 3 Year Guarantee as standard, giving you peace of mind. Our installations also come with a 12 month guarantee. Why not call us today to speak to one of our security experts?